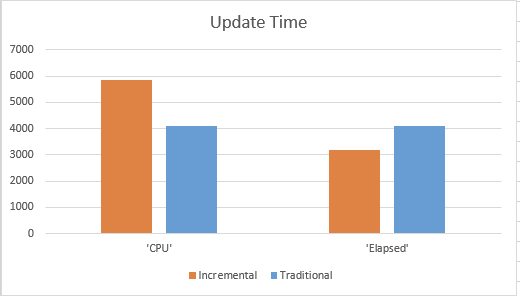 This post is a direct continuation from the previous post on the new Incremental Statistics feature in SQL Server 2014. This time we shall dive into the performance of the Statistics Update statement. 1. The fullscan update of Incremental Statistics spends more resources. In my case a good 30% more CPU Time were spent, which shows that the internal structure of Incremental Statistics which includes an object for each of the partitions plus intermediate aggregates (representing a tree) needs more resources to get updated. This make a lot of sense. I guess it has to do with the fact that Incremental Statistics are being updated in parallel, where Traditional Statistics are being updated in a Single-Thread. This is great, but what about the direct update of statistics on a single partition ? Eureka! 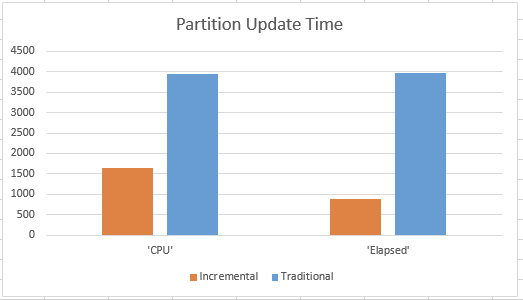 Of course We can’t expect that the traditional statistics will allow us to update the information on a partition level, so that means that we are stuck with the old command without PARTITION. So the execution statement would actually be update statistics dbo.FactOnlineSales ([PtdFactOnlineSales]) with RESAMPLE;.